Bobby Deol is a Bollywood actor, who has earned a great deal of fame because of his dimpled good looks, fit physique and acting talent. He made a good debut in the industry with his dimpled handsome face, fit physique, boyish charm and amazing acting skills, but sadly he faded as quickly as his meteoric rise in the industry. Marital Status: Married to Tanya Ahuja since 1996 and the couple has two sons. Bobby Deol was born in Mumbai in an illustrious Bollywood family, with his father, Dharmendra being the super star of the yesteryears. His mother is Prakash Kaur and his elder brother, Sunny Deol is also a leading Bollywood actor. His step mother Hema Malini and half sisters Eesha Deol and Ahana Deol are also the part of the Deol family. He got his education from prestigious institutions like the Lawrence School, Sanawar and Mayo College, Ajmer. As a youngster, he was known to live a very wild lifestyle, with all night parties on regular basis. He is also known for his love for clothing and accessories and owns hundreds of shirts, trousers, belts and sunglasses. 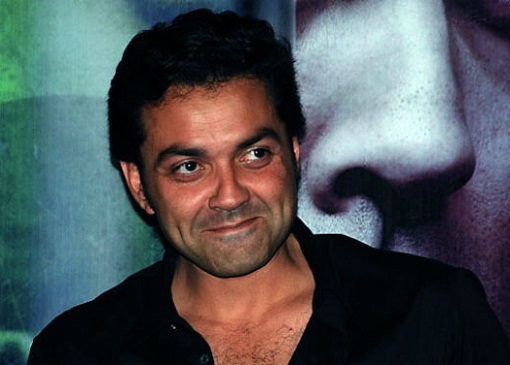 Bobby Deol made his film debut as a young child in 1977, when he was featured in the hit movie of his father “Dharam Veer”. As a young man, he made a debut in 1995 movie “Barsaat”, in which he was introduced opposite to Twinkle Khanna, the daughter of super hit actor, Rajesh Khanna. He was awarded the Filmfare Best Debut Award for his excellent performance in the movie. Then came “Gupt: The Hidden Truth” (1997) in which he co starred with top actresses Kajol and Manisha Koirala, and the film turned out to be a great hit. It was followed by the 2002 hit “Hamraaz”, for which he was nominated for the Filmfare Best Actor Award. He took a long break from acting after it, coming back with the family comedy fare “Yamla Pagla Deewana” (2011), a movie starring Dharmendra, Sunny Deol and Bobby Deol together. This was followed by “Yamla Pagla Deewana 2”, but the sequel did not rock the box office. His slow pace at the box office is attributed to his carefree attitude and doing a limited number of movies, besides making some wrong choices. Bobby Deol was born with a silver spoon in his mouth and inherited a lot of property and wealth from his father, including a home in Mumbai and a sprawling farmhouse in his native village of Sahnewal, Punjab. He resides in a luxurious two storied house in JVPD, Juhu in Mumbai. Additionally, his wife Tanya comes from a wealthy background and will inherit assets worth Rs 300 crore from his father. He owns an amazing collection of luxury cars, including Porsche 911 Carrera SS, Porsche 911 Turbo S, Mercedes S Class and Land Rover Freelander.